Looking for the Wednesday Wandering? Just page back one to learn why a raven is like a writing desk… Well, actually, about why a book cover is like a door. Then come and chat with me and Alan about names. However, those days are ending. More and more Indian settlements are asserting their right to be called by their original names, not the names others gave them. Santo Domingo Pueblo now is officially “Kewa.” In Arizona, the Pima are now known as the Akimel O’odham; the Papago prefer to be called Tohono O’odham. Even with those groups that have not officially renamed themselves, the trend is such that work by an artist may be identified by both names. 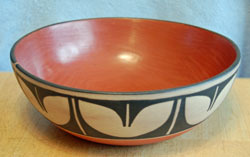 So something from Jemez Pueblo may be also identified as from “Walatowa” – the group’s name for itself. By the way, “Jemez” is a Spanish version of a Towa word given as “hay mish” – the original meaning of which is still argued about. ALAN: We are seeing the same kind of thing here. The highest mountain in New Zealand is Mount Cook. It’s named after James Cook of course (though interestingly he never saw it!). Its Maori name is Aoraki which is actually the name of a person (an old Maori name for the South Island translates as “Aoraki’s Canoe”). In 1998, the government signed an agreement with the major South Island tribe which redressed some of the wrongs perpetrated on them in colonial times. As a result of this agreement, Mount Cook was officially renamed Aoraki / Mount Cook. Both names now appear on maps and both names are commonly used (either singly or together). Well, as you can imagine, the Navajo didn’t much care for this. What’s wonderful, though, is that the proposed name change was supported not only by Navajos, but by a large number of non-Navajos as well. The new name “Narbona Pass” commemorates a Navajo leader – and advocate for peace – who was killed (and scalped) by the American forces. This naming blends cultures in that it follows the Anglo tradition of naming for an honored person. The Navajo traditional name was simply “Copper Pass.” So in the name two worlds meet. ALAN: The meeting of two worlds sometimes has strange side effects. There’s a big volcano in the west of the North Island. The European name is Mount Egmont but for hundreds of years it was known as Taranaki by the local Maori. The name was reviewed in 1986 and now the names Mount Egmont and Mount Taranaki are used interchangeably. Interestingly the Maori prefix “Tara-” means “Mountain,” so Mount Taranaki is obviously a name supplied by the government’s official Department Of Redundancy Department. JANE: We’re running into something similar here. One complication is that Spanish spellings don’t lead to intuitive pronunciations for non-Spanish speakers. A good example is “Jicarilla.” This name, which means “little cup” or “little drinking gourd,” was attached to several areas and even an Apache tribe. Most English-speakers would pronounce it “ji-ka-ril-a.” Its actual pronunciation is closer to “hik-a-ree-a.” The quirks of Spanish pronunciation can be managed with a little tutoring. However, when an Indian group insists on something being referred to by a pronunciation closer to their language, this can cause problems. The Hopi make a ceremonial figure called a “kachina.” These have become very popular in art, so much so that other tribes make them for the tourist market. Some Hopi insist that the word is pronounced closer to “katsina” and would like everything changed, but as this has led to a lot of confusion, at least at this point, the change has not become general. ALAN: I find it fascinating that the places where you and I live are so far apart from each other and yet so similar in the way they work. Is it too trite to say that people are the same the whole world over? JANE: It’s only trite if you forget how very different they are as well. This entry was posted on April 5, 2012 at 1:00 am and is filed under Thursday Tangents. You can follow any responses to this entry through the RSS 2.0 feed. You can leave a response, or trackback from your own site. This is a place where GIS (geographic information systems) have really messed things up, isn’t it? The issue is that these systems are all tables of data. If there are three different ways of spelling a place name, that’s not so useful, because different bits of data get associated with different names, and never get associated with each other. So now we have to standardize the names. Sigh. What’s interesting to me about names is how they shape perception. They aren’t just “tags,” and yet they should be part of the landscape. That’s what makes subdivisions with names like Purple Crescent — and nothing is purple — so maddening. The other interesting thing about this is that “Narbona” was his Spanish name rather than his Navajo name–but the idea of giving it his Spanish name, from what I’ve heard, was supported by the Navajo because it was allowed in their custom of not naming the dead.